When someone asks me “where do you come from”, my reply is generally “I’m Welsh. A Welsh Jones. Descended from a long line of Joneses” (and Lewises and Williamses and Howells and so on). But then I have to qualify this, not least because I don’t sound Welsh: I sound like someone who’s spent 15 years in Cambridge (with maybe a bit of east midlands/Yorkshire influence). I was born in England (Stamford, Lincolnshire); my father had left Wales to join the Air Force, so my early childhood was spent trailing around a series of RAF bases in the Midlands and Eastern England. It was only after I finally left home that my parents moved back to Wales. The only time I properly lived in Wales myself was for a year in 1967, an experience that was so alienating and unhappy that, even though it was a short time, and a long time ago, it colours my emotional response to that part of North Wales, the Lleyn Peninsular. The circumstances were this – after a couple of postings in East Anglia, my father was sent abroad, to help with what turned out to be the shambolic and violent end of one corner of the British Empire, in Aden, now in the Yemen. Aden was then a Crown Colony, a strategic port and military base for the British, usefully placed on the way to India and the Far East. Britain’s retreat from Empire reduced the port city’s value, but through the mid-1960’s a worsening insurgency had destabilised the British’s attempt to install a friendly government before they left. By 1967 parts of the city were alternately a no-go zone for the British troops, then being reoccupied with some brutality. Finally (and I think uniquely in the end of Empire) there was no orderly hand-over when the British left, no ceremonial lowering of the flag, no hand-shakes between the Governor-General and the incoming President, just a scramble by the British forces to get out with as much of their kit as they could carry. My father’s part in the retreat, having organised the repatriation of the remaining families, was to tip Radio Aden’s record collection off the Steamer Point quay into the harbour, to make sure the Communist hordes of FLOSY and NLF didn’t benefit from the latest Jazz and Pop sounds (for some reason he saved one Thelonius Monk album, which I still possess). 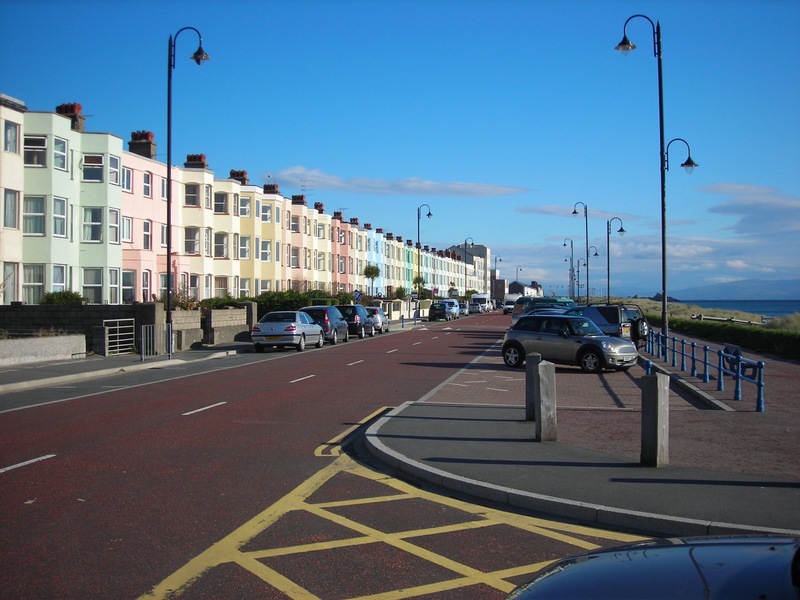 Aden was clearly not a place for dependents, so my mother and I were packed off to the North Wales seaside town of Pwllheli, where my mother’s parents lived. There my mother tried to avoid reading the newspapers, with their reports from Aden of random shootings and grenade attacks, while the six-year-old me went off friendless to a new school. I remember the terrible food and the boys’ toilet, outside, in the corner of the playground, a slate urinal brilliant green with moss and with an overwhelming ammoniacal smell of decaying boys’ urine. The school was old-fashioned in teaching methods and discipline – I vividly remember an assembly with a purple faced teacher standing on a stage, roaring with anger and threateningly waving his stick above his head. I never found out what atrocity it was that some child had committed, as the diatribe was conducted, like all the other business of the school, entirely in Welsh, a language I didn’t know then (and still don’t). West End Parade, Pwllheli, N. Wales. A flat in one of these houses was my unhappy home for a year. My mother must have been bored, worried, lonely. At least she had a car, a sweet little Mini, in which she frequently drove me to Caernarvon Castle, with which I became fascinated. She would take her own father on trips a few miles up the coast, to see his friend, the priest and poet R.S. Thomas. I don’t exactly know what had drawn Thomas and my grandfather together, whether that was religion, or poetry, or simply a shared gloomy disposition. My grandfather died before I got to know him properly; I know he was a cultured man, though he had dropped out of theological college to become a Conservative Party activist. Stagnating productivity is one of the biggest problems the UK faces, and it’s the most compelling reason why, despite a tight fiscal climate, the science and innovation budget should be preserved (and ideally, increased). It’s clear that the government regards deficit reduction as its highest priority, and in pursuit of that, all areas of public spending, including the science budget, are under huge pressure. But the biggest threat to the government’s commitments on deficit reduction may not be the difficulty in achieving departmental spending cuts – it is the possibility that the current slowdown in productivity growth, unprecedented in recent history, continues. 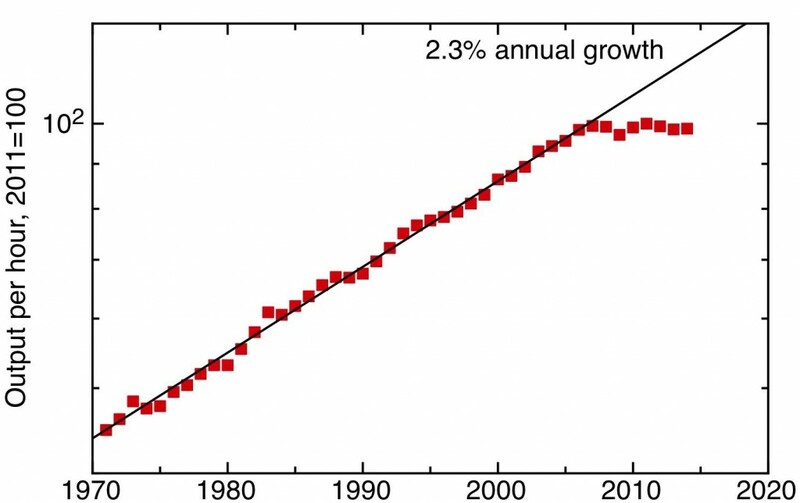 Over many decades, labour productivity in the UK (the amount of GDP produced per hour of labour input) has increased at a steady rate. After the financial crisis in 2008, that steady increase came to an abrupt halt, since when it has flat-lined, and is now at least 15% below the pre-crisis trend. The UK’s productivity performance was already weaker than competitors like the USA, and since the crisis this gap with competitors has opened up yet further. If productivity growth does not improve, the government will miss all its fiscal targets and living standards will continue to stagnate. Productivity growth, fundamentally, arises from innovation in its broadest sense. The technological innovation that arises from research and development is a part of this, so in searching for the reasons for our weak productivity growth we should look at the UK’s weak R&D investment. This is not the only contributory factor – in recent years, the decline in North Sea oil and a decline in productivity in the financial services sector following the financial crisis provide a headwind that’s not going to go away. This means that we’ll have to boost innovation in other sectors of the economy – like manufacturing and ICT – even more, just to get back to where we were. R&D isn’t the only source of innovation in these and other sectors, but it’s the area in which the UK, compared to its competitors, has been the weakest. The UK has, for many years, underinvested in R&D – both in the public and the private sectors – compared to traditional competitors like France, Germany and the USA. 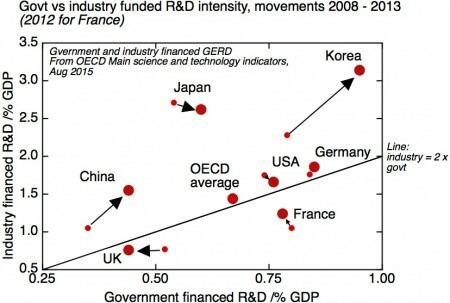 In recent years, Korea has emerged as the most R&D intensive economy in the world, while China overtook the UK in R&D intensity a few years ago. This is a global race that we’re not merely lagging behind in, we’re running in the wrong direction. In the short term of an election cycle, it’s probably private sector R&D that has the most direct impact on productivity growth. The UK’s private sector R&D base is not only proportionately smaller than our competitors; more than half of it is done by overseas owned companies – a uniquely high proportion for such a large economy. It is a very positive sign of the perceived strength of the UK’s research base, that overseas companies are so willing to invest in R&D here. But such R&D is footloose. Much evidence shows that public sector R&D spending “crowds in” substantial further private sector R&D. The other side of that coin is that continuing – or accelerating – the erosion of public investment in R&D that we’ve seen in recent years will lead to a loss of private sector R&D, further undermining our productivity performance. The timescale over which these changes could unfold could be uncomfortably fast. These are the short-term consequences of the neglect of research, but the long-term effects are potentially even more important, and this is something that politicians concerned about their legacy might want to reflect on. The big problems that society faces, and that future governments will have to grapple with – running a health service with a rapidly ageing population, ensuring an affordable supply of sustainable, low carbon energy, to give just two examples – will need all the creativity and ingenuity that science, research and innovation can bring to bear. The future is unpredictable, so there’ll undoubtedly be new problems to face, and new possibilities to exploit. A strong and diverse science base will give our society the resilience to handle these. So a government that was serious about building the long-term foundations for the continuing health and prosperity of the nation would be careful to ensure the health of the research base that will underpin those necessary innovations. One way of thinking of our current predicament is that we’re doing an experiment to see what happens if you try to run a large economy at the technology frontier with an R&D intensity about a third smaller than key competitors. The outcome of that experiment seems to be clear. We have seen a slowdown in productivity growth that has persisted far longer than economists and the government expected, and this in turn has led to stagnating living standards and disappointing public finances. Our weak R&D performance isn’t the only cause of these problems, but it is perhaps one of the easiest factors to put right. This is an experiment we should stop now. Was the industrial revolution an energy revolution, in which the energy constraints of a traditional economy based on the power of the sun were broken by the discovery and exploitation of fossil fuel? Or was it an ideological revolution, in which the power of free thinking and free markets unlocked human ingenuity to power a growth in prosperity without limits? Those symbols of the industrial revolution – the steam engine, the coke-fuelled blast furnace – suggest the former, but the trend now amongst some economic historians is to downplay the role of coal and steam. What I think is correct is that the industrial revolution had already gathered much momentum before the steam engine made a significant impact. But coal was central to driving that early momentum; its use was already growing rapidly, but the dominant use of that coal was as a source of heat energy in a whole variety of industrial processes, not as a source of mechanical power. The foundations of the industrial revolution were laid in the diversity and productivity of those industries propelled by coal-fuelled process heat: the steam engine was the last thing that coal did for the industrial revolution, not the first. What’s apparent, and perhaps surprising, from a plot of the relative contributions of coal and firewood to England’s energy economy, is how early in history the transition from biomass to fossil fuels took place. Using estimates quoted by Wrigley (a compelling advocate of the energy revolution position), we see that coal use in England grew roughly exponentially (with an annual growth rate of around 1.7%) between 1560 and 1800. 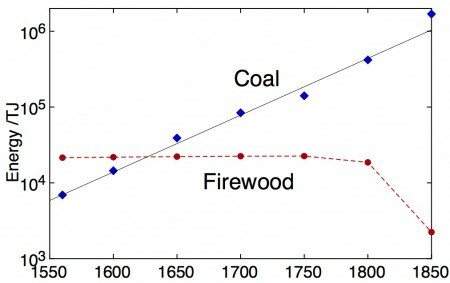 The crossover between firewood and coal happened in the early seventeenth century, a date which is by world standards very early – for the world as a whole, Smil estimates this crossover only happened in the late 19th century. Estimated consumption of coal and biomass fuels in England and Wales; data from Wrigley – Energy and the English Industrial Revolution. I have a much shorter version of my earlier three-part series (PDF version here) on the connection between the UK’s weak and worsening R&D performance and its current productivity standstill on HEFCE’s blog: Innovation, research and the UK’s productivity crisis. The same piece has also been published on the blog of the Sheffield Political Economy Research Institute: Continuing on our current path of stagnating productivity and stagnating innovation isn’t inevitable: it’s a political choice, and it also appears on the web-based economics magazine Pieria. The longer and more detailed post also formed the basis for my written evidence to the House of Commons Business Innovation and Skills Select Committee, which is currently inquiring into the productivity problem: On productivity and the government’s productivity plan (PDF). Finally, here’s another graphical representation of the productivity problem in historical context, using the latest version of the Bank of England’s historical dataset “Three centuries of macroeconomic data”. It shows the total growth in hourly labour productivity over the preceding seven years; on this measure the current productivity slow-down is worse than that associated with two world wars and a great depression. Seven year growth in hourly labour productivity. Data from Hills, S, Thomas, R and Dimsdale, N (2015) “Three Centuries of Data – Version 2.2”, Bank of England. How does the UK compare with other leading research intensive economies, and how has its relative position changed in recent years? The graph above is an attempt to answer both questions graphically, separating out the contributions of both the public sector and the private sector to the overall R&D intensity of the economy as a proportion of GDP, and illustrating the trajectories of this expenditure since 2008. The UK stands out as having begun the period with a weak R&D performance, and since then it has gone in the wrong direction. Plotting both the private sector and public sector contributions to national R&D efforts stresses that there is a positive correlation between the two – public sector R&D tends to “crowd in” private R&D spending (1). Across the OECD on average, the private sector spends roughly twice as much on R&D as does the public sector, though in East Asian countries the private sector does more. The UK is substantially less R&D intensive than major competitors, and both public and private sectors contribute to this weak performance. (Added 2/9/2015: For those who dislike the 3-part blog format, the whole article can be downloaded as a PDF here: Innovation, research and development, and the UK’s productivity crisis). The UK’s productivity problem is an innovation problem. This conclusion follows from the analysis of Goodridge, Haskel and Wallis, at least if one equates the economist’s construction of total factor productivity with innovation. This needs some qualification, because when economists talk about innovation in this context they mean anything that allows one to produce more economic output with the same inputs of labour and capital. So this can result from the development of new high value products or new, better processes to make existing products. Such developments are often, but not always, the result of formal research and development. But there are many other types of innovation. People continually work out better ways of doing things, either as a result of formal training or simply by learning from experience, they act on suggestions from users, they copy better practises from competitors, they see new technologies in action in other sectors and apply them in their own, they work out more effective ways of organising and distributing their work; all these lead to total factor productivity growth and count as innovation in this sense. This the second in a series of three posts, and continues directly from part 1. There are many theories of why the UK’s productivity growth has stalled, and in the absence of proper analysis it’s all too easy to chose a favoured hypothesis on the basis of anecdotes or a single data point, picked out to fit one’s ideological predilections. Indeed, I could be accused of doing just that, by drawing attention the UK’s weak R&D record; others might immediately start looking at a lack of competitiveness in the economy, or insufficient deregulation, as the root of the issue. But it would be surprising if such a striking occurrence had just a single cause, so a more careful analysis should help us not just by ruling possible causes in or out, but by ascribing different weights to multiple causes. This is the first of a series of three posts in which I bring together some thinking and reading I’ve been doing about the UK’s current productivity problem, and its relationship to innovation and to research and development. In part 1, here, I take stock of the scale of the UK’s productivity problem and discuss why it matters so much, both economically and politically. Then I’ll set the context for the following discussion with a provocative association between productivity growth and R&D intensity. In part 2, I’ll review what can be said with more careful analyses of productivity, looking at the performance of individual sectors and testing some more detailed explanations of the productivity slowdown. I’ll pick out the role of declining North Sea oil and gas and the end of the financial services bubble in the UK’s poor recent performance; these don’t explain all the problem, but they will provide a headwind that the economy will have to overcome over the coming years. Finally in part 3 I’ll return to a more detailed discussion of innovation in general and the particular role of R&D, finishing with some thoughts about what should be done about the problem. The UK’s current stalling of productivity growth is probably the UK’s most serious current economic problem. In terms of output per hour, the last five years’ productivity performance has been by far the worst period in the last 45 years. Many other developed economies have had disappointing productivity growth in recent years, but the UK’s record is particularly bad. Amongst other developed economics, only Luxembourg and Greece have done worse since 2007, according to a recent OECD report on the future of productivity (see table A2, p83). 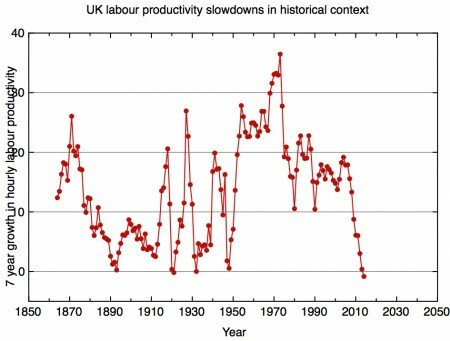 Labour productivity since 1970. The fit is an exponential corresponding to constant growth of 2.3% a year. ONS data. I’m sure there are some people who, very early on in their lives, work out what they want to do and then set out single-mindedly to achieve their aims. For the rest of us, choices are made and paths are set without us really being conscious of those junctions, so we look back and wonder how was it that our lives unfolded in this way and not in another. And yet, looking back, we sometimes can see moments, or short periods, that were decisive in setting us down one path and cutting off other possibilities. 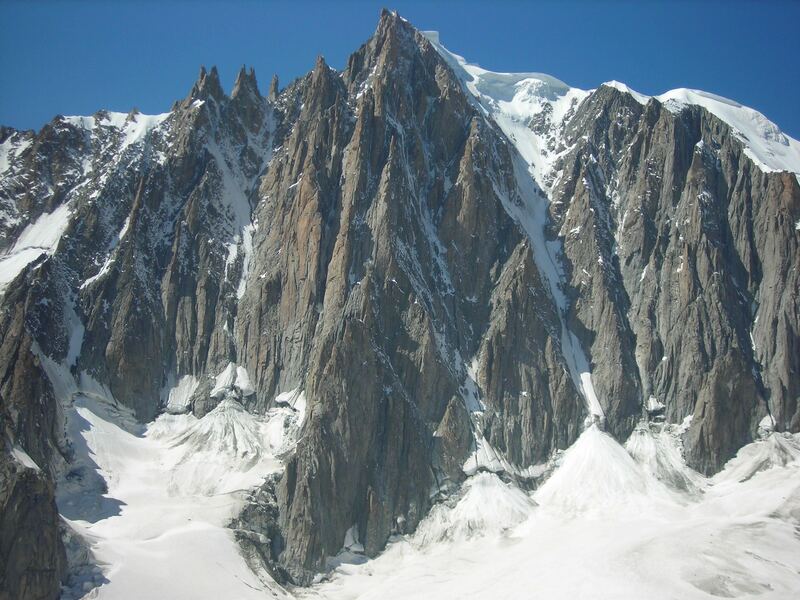 For me, the summer of 1982 was the time that determined that I was going to end up being a scientist, and to some extent what sort of scientist I would end up being, though I don’t suppose at any moment at the time I had any idea that this was the case. Did the government build the iPhone? Would the iPhone have happened without governments? The iPhone must be one of the most instantly recognisable symbols of the modern “tech economy”. So, it was an astute choice by Mariana Mazzacuto to put it at the centre of her argument about the importance of governments in driving the development of technology. Mazzacuto’s book – The Entrepreneurial State – argues that technologies like the iPhone depended on the ability and willingness of governments to take on technological risks that the private sector is not prepared to assume. She notes also that it is that same private sector which captures the rewards of the government’s risk taking. The argument is a powerful corrective to the libertarian tendencies and the glorification of the free market that is particularly associated with Silicon Valley. Her argument could, though, be caricatured as saying that the government built the iPhone. But to put it this way would be taking the argument much too far – the contributions, not just of Apple, but of many other companies in a worldwide supply chain that have developed the technologies that the iPhone integrates, are enormous. The iPhone was made possible by the power of private sector R&D, the majority of it not in fact done by Apple, but by many companies around the world, companies that most people have probably not even heard of. And yet, this private sector R&D was indeed encouraged, driven, and indeed sometimes funded outright, by government (in fact, more than one government – although the USA has had a major role, other governments have played their parts too in creating Apple’s global supply chain). It drew on many results from publicly funded research, in Universities and public research institutes around the world. So, while it isn’t true to say the government built the iPhone, what is true is to say that the iPhone would not have happened without governments. We need to understand better the ways government and the private sector interact to drive innovation forward, not just to get a truer picture of where the iPhone came from, but in order to make sure we continue to get the technological innovations we want and need. The iPhone (and the modern smartphone more generally) is, truly, an awe-inspiring integration of many different technologies. It’s a powerful computer, with an elegant and easy to use interface, it’s a mobile phone which connects to the sophisticated, computer driven infrastructure that constitutes the worldwide cellular telephone system, and through that wireless data infrastructure it provides an interface to powerful computers and databases worldwide. Many of the new applications of smartphones (as enablers, for example, of the so-called “sharing economy”) depend on the package of powerful sensors they carry – to infer its location (the GPS unit), to determine what is happening to it physically (the accelerometers), and to record images of its surroundings (the camera sensor). Mazzacuto’s book traces back the origins of some of the technologies behind the iPod, like the hard drive and the touch screen, to government funded work. This is all helpful and salutary to remember, though I think there are two points that are underplayed in this argument. Firstly, I do think that the role of Apple itself (and its competitors), in integrating many technologies into a coherent design supported by usable software, shouldn’t be underestimated – though it’s clear that Apple in particular has been enormously successful in finding the position that extracts maximum value from physical technologies that have been developed by others. Secondly, when it comes to those physical technologies, one mustn’t underestimate the effort that needs to go in to turn an initial discovery into a manufacturable product. A physical technology – like a device to store or display information – is not truly a technology until it can be manufactured. To take an initial concept from an academic discovery or a foundational patent to the point at which one has a a working, scalable manufacturing process involves a huge amount of further innovation. This process is expensive and risky, and the private sector has often proved unwilling to bear these costs and risks without support from the state, in one form or another. The history of some of the many technologies that are integrated in devices like the iPhone illustrate the complexities of developing technologies to the point of mass manufacture, and show how the roles of governments and the private sector have been closely intertwined. For example, the ultraminiaturised hard disk drive that made the original iPod possible (now largely superseded by cheaper, bigger, flash memory chips) did indeed, as pointed out by Mazzucato, depend on the Nobel prize-winning discovery by Albert Fert and Peter Grünberg of the phenomenon of giant magnetoresistance. This is a fascinating and elegant piece of physics, which suggested a new way of detecting magnetic fields with great sensitivity. But to take this piece of physics and devise a way of using it in practise to create smaller, higher capacity hard disk drives, as Stuart Parkin’s group at IBM’s Almaden Laboratory did, was arguably just as significant a contribution. Author Richard JonesPosted on July 3, 2015 July 3, 2015 Categories Nanobusiness, Science policy, Social and economic aspects of nanotechnology3 Comments on Did the government build the iPhone? Would the iPhone have happened without governments?